In 1865, Mary Mapes Dodge published a children's book set in Holland called Hans Brinker -or- The Silver Skates. The title character Hans Brinker is a very poor boy who lives with his sister, mother and disabled father; next to it is a storyline of a group of better-off boys from the same town who on a skating tour in the heart of Holland visit museums and famous places, giving Mrs Dodge an opportunity to tell about Holland, and she does that nicely. Judging from the book, Mrs Dodge really read up on Dutch history and culture; there are a few typos in the historical names but most are correct. Unfortunately, the names of the Dutch characters in the story are a mess, and many of the common Dutch words are spelled incorrectly. For several of the characters I did not see right away what their correct Dutch names would be. I'm afraid that the person Mrs Dodge consulted on common names and words did not know much Dutch, was not familiar with Dutch spelling and probably had really bad handwriting (I was wondering what 'Voost' could be when I thought that Mrs Dodge may have read English-phonetic 'Yoost' as 'Voost' - in proper Dutch 'Joost' - Dutch J sounds like English Y in YES.) I have two print editions of the book, an Airmont Classic from 1966, and a Tor Book from 1993. Both have about the same mistakes with Dutch. It's amazing that in 100 years no publisher has bothered to ask a native speaker of Dutch to look it over - or didn't care about Dutchmen's comments: I find it hard to believe that I would be the first to notice the problems. Maybe it's like the casting in 'Miracle on 34th Street' - "The Dutch are an insignificant part of our audience." - in the movie a little girl is brought to Santa Claus, and he is told she only speaks Dutch and doesn't understand English. Not a problem for polyglot Santa - but then the Dutch people in the audience will notice the little girl's thick American accent: to Dutchmen, it's not credible that she doesn't speak English. For the Dutch any illusion of reality is shattered. No, Virginia. Contrary to popular thinking, it's not Hans Brinkers who puts his finger in the dike and saves the country: in the book that's a story told in a classroom in England, and the boy is not named. There is no story or actual event like it in Holland. Broom probably: Bram Washington Irving has a Dutch-American character 'Brom' - that English spelling is phonetically closer to Dutch Bram. The fairy tale of the witch in the gingerbread house is Hans en Grietje 2 in Dutch, 'Hansel und Gretel' in German. A strange footnote in the book says 'Carl, Gretel and Ludwig were named after German friends,' and gives the Dutch versions of the names. It doesn't make the story more realistic. Eijck Name of a tulip in the wild tulips speculation of 1637. I'd never heard of this admiral before - according to an article by Liesbeth Missel, curator of Wageningen University Library, Holland, 'admiral' (admiraal 2) and 'general' (generaal 2) in tulip names refers to coloring. Hear more Dutch tulip names. Willem Beukles Willem Beukelsz. 2. Herring is gutted and immersed in brine for preservation: haring kaken . Dutch fishermen had discovered that the taste of the fish was greatly improved by leaving in the pancreas (alvleesklier ) - its enzymes would do something beneficial to the fish meat. Traditionally ascribed to Willem Beukelsz. aka Willem Beukelszoon , ca 1400. Jan van Gorp 2 better known by the latinized version of his name: Goropius 2 - 17th Century linguist who claimed that Dutch was the mother of all languages. Volgens Goropius spraken Adam en Eva Nederlands. 2 According to Goropius, Adam and Eve spoke Dutch. Goropius zegt dat Adam en Eva Nederlands spraken. 2 Goropius says that Adam and Eve spoke Dutch. "Adam en Eva spraken Nederlands in het Paradijs." "Adam and Eve spoke Dutch in Paradise." "In het Paradijs spraken Adam en Eva Nederlands" 2 "In Paradise, Adam and Eve spoke Dutch." Van Tromp Tromp 2 - family name of two 17th Century admirals, Maarten Harpertszoon Tromp 2 and Cornelis Tromp. Amsterdam the capital of Holland, though parliament meets in The Hague, and most government buildings and embassies are in that city too. Washington Irving calls it 'Saardam' too. the Y, the Eye het IJ - a body of water near Amsterdam. Dame Brinker There is a Dutch word (de) dame meaning 'a woman who is respected.' A speaker addressing an audience will start with "Dames en Heren," 2 ('ladies and gentlemen.') But 'Dame' is not a title in Dutch. Maybe Mrs Dodge meant to use the archaic English address when she wrote 'Dame Brinker,' but I do suspect she thought it was correct Dutch. hoezza! a strange mixture of hoera 2 and hoezee 2 - both meaning 'hurrah,' though 'hoezee' is by now a bit old-fashioned. meester 'master' - a schoolteacher or an accomplished person. trekschuit a horse-drawn barge. 17th and 18th Century Holland had a network of ship channels for those barges. It was like a railroad system. According to Mrs Dodge, the trekschuit transported people, and the pakschuit transported goods ('packages.') The book writes trekschuit correctly, but in the next line pakschuyt with Y - careless? Years after I wrote the above I was looking for an unusual meaning for 'voet' in a dictionary and I came accross the phrase 'de overwonnenen de voeten spoelen' 2 - consign the vanquished to the deep. 'the Dutch mile' Mrs Dodge writes: 'The Dutch mile is more than four times as long as ours.' That would be about 7.4 kilometers. I had never heard of it, so I looked it up in my old 'Van Dale' Dutch dictionary. It says the German mile is 7.4 km, and the Dutch mile is 5.5 km. Around 1800 the metric system was introduced in Holland. In early 1953, the combination of a very high tide and a full day of high winds from exactly the wrong direction caused widespread flooding in Southwestern Holland. 1854 People died. The water kept rising after the tide was expected to turn - it must have been very frightening. 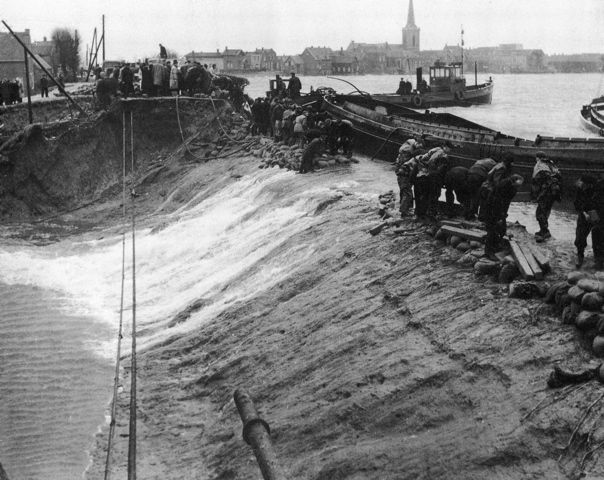 In several places, dikes collapsed when large amounts of water came over and washed away the dike on the landside. A levee called the Schielandse Hoge Zeedijk 2 in the city of Ouderkerk aan de IJssel 2 (see arrow in map) was weakening, threatening inundation of densely populated areas near Rotterdam. Authorities were considering blowing up a church tower to strengthen the levee with its debris, when Skipper Arie Evegroen offered to sail his river barge De Twee Gebroeders ('The Two Brothers') in front of the weak spot. He sank it there and averted a major disaster. Most books and websites say Mr Evegroen was ordered to surrender his ship, but 'De Deltawerken' (by Hilde de Haan and Ids Haagsma, Waltman, Delft 1984) quotes 'the father of the Delta Protection Plan' Johan van Veen praising Mr Evegroen for sacrificing his ship, and I think that's more credible.